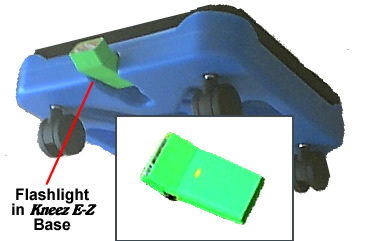 Kneez E-Z maneuvers in tight areas smoothly and operates quietly on a hard surface with its special 3 inch twin casters and Urethane tread construction. All of this gives a special added value guarantee not to mark a floor. The cushion is made of a two component material with an exclusive protective covering offering a soft and cushioning, gravity defying, weightless feeling. 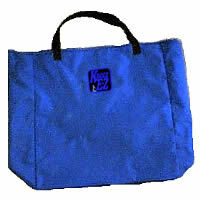 Kneez E-Z takes the stress off backs and knees to increase productivity while reducing fatigue. Use Kneez E-Z for plumbing, carpentry, papering, electrical, floor coverings, cleaning chores of many kinds, landscaping, washing floors, painting, auto detailing, hem alterations, and machinery maintenance just to name a few of its many uses. Your knees are cradled in cushioned comfort, even under extended periods of use. You won’t know you’re kneeling! Floodlight reflector covers ten times more work area than a standard flashlight. Special feature includes the removable battery pack for easy loading. Carry an extra battery pack with you to the job. Lets you keep it handy if you need to change batteries. It’s small enough to slip into your pocket. Or you can remove the pack and change batteries outside the light. The complete pack slips into the light easily, making battery changes simpler and faster. Extra battery pack available for additional purchase. * Alkaline batteries recommended for longer use and storage life. Batteries not included. as well as every optional product is proudly made in the USA.